Tumalo Art Co. features new mixed media wildlife art by Shelli Walters in August. The Peace of Wild Things, opening during the First Friday Gallery Walk, August 4, from 4-8pm, is inspired by Wendell Berry’s iconic poem of the same name. 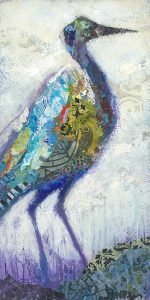 Using her multi-layered mixed media technique of collaging and texturing with paper and acrylic paint, Shelli presents a series of wildlife art that capture the heart of the poem, “I come into the peace of wild things”. A heron, a majestic elk, a bison — all caught in a moment of tranquility, living in synch with the earth. Shelli enjoys the playful interactions and surprises that occur when alternating layers of collage and acrylic paint. “Having been a graphic designer for 20+ years I find tearing up discarded graphic materials and giving them new life in my paintings cathartic. 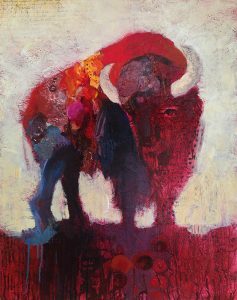 I am drawn to bold color as a way to convey the urgency and power of living life in the moment.” Layers upon layers of paint and collage add depth and texture to Shelli’s works—inviting the viewer to look closer and discover. Tumalo Art Co. is an artist-run gallery in the heart of the Old Mill District in Bend, Oregon. The gallery is open seven days a week, 10am -8pm Monday through Saturday and 1am-6pm on Sunday. See more art on our website. Call 541-385-9144 for more information.